Revenue from baggage fees in three quarters of 2010 is five times what it was in all of 2007. (CNN) -- Baggage fees may irritate you, but airlines sure aren't complaining. 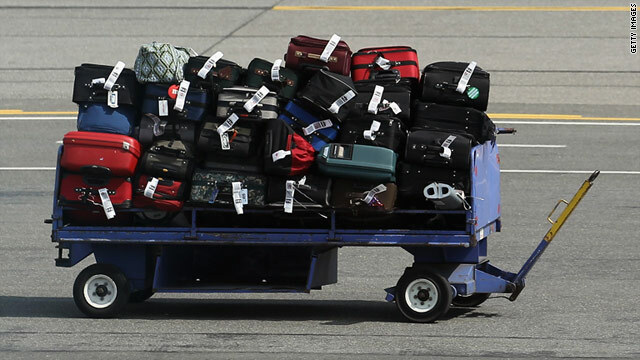 Airlines have raked in more than $2.5 billion so far this year on baggage fees alone, a number up 22.5 percent since this time last year, according to the Bureau of Transportation Statistics. And fees will continue to climb as long as the market will bear it, said Michael Boyd, president of Boyd Group International, an aviation consulting firm. "For the average passenger, you are paying more," Boyd said. "These ancillary revenues are making airlines profitable. But it's the name of the game. People are paying it, people aren't revolting, and so they'll be there forever." At the top of the baggage fee revenue list is Delta Air Lines, followed by American Airlines and US Airways. In three quarters, Delta already has surpassed its total baggage fee revenue from 2009. Delta has made $733 million so far this year. In all of 2009, it made $481 million. Revenue from baggage fees has been skyrocketing since 2007, when the total revenue was $464 million, one-fifth of what's been made in three quarters in 2010. Similarly, revenue from cancellation and change fees has nearly doubled since 2007, adding up to about $1.7 billion in three quarters this year, according to the Bureau of Transportation Statistics. In 2007, fees totaled $915 million, though 2010's numbers actually fell 3.8 percent in the third quarter from the same time last year. Topping the cancellation and change revenue list is Delta, American and United Airlines. Boyd estimates that between 9 percent and 12 percent of a major airline's revenue comes from ancillary fees, including baggage and cancellation fees, among others. "Some of the change fees are, frankly, thuggish," he said. "They're capitalizing on the anxiety and uncertainty that passengers have when they fly. They have a right to charge for bags, but to charge a 'service' fee for changing your flight three months from now. ... That's just gouging."